The Wooden Bow. A weapon so versatile its use has stretched throughout history, beginning as an essential tool to feed Neolithic people to a formidable weapon of war. It has proved instrumental in shaping the advancement of humankind. This 4 day course set in our magnificent 16 century barn will start by introducing the students to the different designs bows have taken and the reasons their makers used these designs. Armed with this knowledge students can then decide on a design to make and then choose a suitable stave. With stave in hand the initial bow making process will then begin using traditional hand tools and techniques. Once the bows are roughed out, we then move onto the real bow making, tillering, the process of training the bow to bend. Different techniques will be explored to give students a comprehensive understanding of this process allowing them to produce a bow that will arrive at draw length and draw weight. String making and types of materials will also be covered along with arrow making. 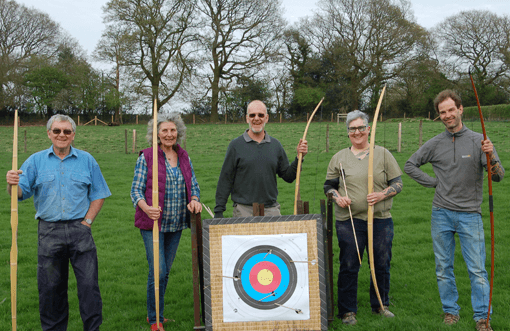 At the end of the course the group can then try their new bows and arrows on the range. This course is led by Nick McMillen who has been making bows and teaching bow making since 2006. He works passionately on his own bowyery with continual experimentation in wood types, designs and techniques. This adventurous approach has led him to keep records of each bow made as another aid to understanding the performance of differing designs and woods. This continuously growing knowledge combined with his teaching experience means he has encountered pretty much all of the issues students are likely to come across. 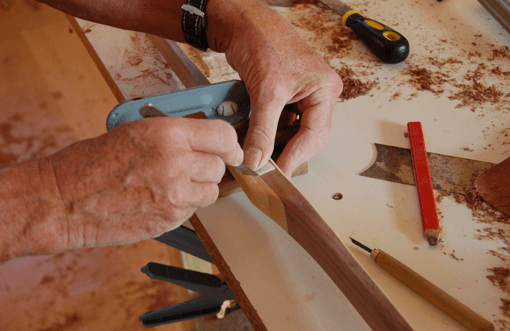 From the novice to the experienced carpenter the teaching on this course will guide each student though the many problems and pitfalls in the bow making process. Please note that this course is self-catering, although we offer home-made cakes, biscuits and drinks throughout the course. Camping is available on site at an extra cost of £6 per night. Cooking facilities are available in the barn for campers.